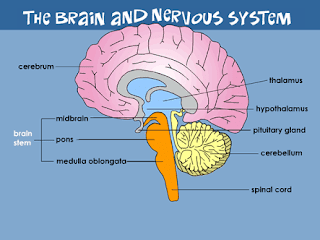 The nervous system includes both the Central nervous system and Peripheral nervous system. The Central nervous system is made up of the brain and spinal cord and The Peripheral nervous system is made up of the Somatic and the Autonomic nervous systems. 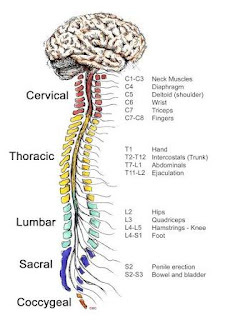 The nervous system consists of the brain, spinal cord, sensory organs, and all of the nerves that connect these organs with the rest of the body. Together, these organs are responsible for the control of the body and communication among its parts. The brain and spinal cord form the control center known as the central nervous system (CNS), where information is evaluated and decisions made. The sensory nerves and sense organs of the peripheral nervous system (PNS) monitor conditions inside and outside of the body and send this information to the CNS. Efferent nerves in the PNS carry signals from the control center to the muscles, glands, and organs to regulate their functions. The brain and spinal cord form the control center known as the central nervous system (CNS), where information is evaluated and decisions made. The sensory nerves and sense organs of the peripheral nervous system (PNS) monitor conditions inside and outside of the body and send this information to the CNS. Efferent nerves in the PNS carry signals from the control center to the muscles, glands, and organs to regulate their functions. Nervous systems are found in most multicellular animals, but vary greatly in complexity. The only multicellular animals that have no nervous system at all are sponges, placozoans, and mesozoans, which have very simple body plans. The nervous systems of the radially symmetric organisms ctenophores (comb jellies) and cnidarians (which include anemones, hydras, corals and jellyfish) consist of a diffuse nerve net. All other animal species, with the exception of a few types of worm, have a nervous system containing a brain, a central cord (or two cords running in parallel), and nerves radiating from the brain and central cord. The size of the nervous system ranges from a few hundred cells in the simplest worms, to around 300 billion cells in African elephants. The brain and spinal cord together form the central nervous system, or CNS. The CNS acts as the control center of the body by providing its processing, memory, and regulation systems. The CNS takes in all of the conscious and subconscious sensory information from the body’s sensory receptors to stay aware of the body’s internal and external conditions. Using this sensory information, it makes decisions about both conscious and subconscious actions to take to maintain the body’s homeostasis and ensure its survival. The CNS is also responsible for the higher functions of the nervous system such as language, creativity, expression, emotions, and personality. The brain is the seat of consciousness and determines who we are as individuals. The central nervous system is divided into two major parts: the brain and the spinal cord. The brain weighs approximately 1.3 to 1.4 kg. It has nerve cells called the neurons and supporting cells called the glia. There are two types of matter in the brain: grey matter and white matter. Grey matter receives and stores impulses. Cell bodies of neurons and neuroglia are in the grey matter. White matter in the brain carries impulses to and from grey matter. It consists of the nerve fibers (axons). The brain stem is also known as the Medulla oblongata. It is located between the pons and the spinal cord and is only about one inch long. The cerebrum forms the bulk of the brain and is supported on the brain stem. The cerebrum is divided into two hemispheres. Each hemisphere controls the activities of the side of the body opposite that hemisphere. This is located behind and below the cerebrum. The diencephalon is also known as the fore brain stem. It includes the thalamus and hypothalamus. The thalamus is where sensory and other impulses go and coalesce. The spinal cord is along tube like structure which extends from the brain. The spinal cord is composed of a series of 31 segments. A pair of spinal nerves comes out of each segment. The region of the spinal cord from which a pair of spinal nerves originates is called the spinal segment. Both motor and sensory nerves are located in the spinal cord. 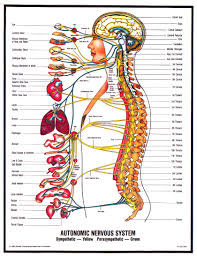 The spinal cord is about 43 cm long in adult women and 45 cm long in adult men and weighs about 35-40 grams. It lies within the vertebral column, the collection of bones (back bone). The spinal cord is a long, thin mass of bundled neurons that carries information through the vertebral cavity of the spine beginning at the medulla oblongata of the brain on its superior end and continuing inferiorly to the lumbar region of the spine. In the lumbar region, the spinal cord separates into a bundle of individual nerves called the cauda equina (due to its resemblance to a horse’s tail) that continues inferiorly to the sacrum and coccyx. The white matter of the spinal cord functions as the main conduit of nerve signals to the body from the brain. The grey matter of the spinal cord integrates reflexes to stimuli. Extending from the left and right sides of the spinal cord are 31 pairs of spinal nerves. The spinal nerves are mixed nerves that carry both sensory and motor signals between the spinal cord and specific regions of the body. The 31 spinal nerves are split into 5 groups named for the 5 regions of the vertebral column. Thus, there are 8 pairs of cervical nerves, 12 pairs of thoracic nerves, 5 pairs of lumbar nerves, 5 pairs of sacral nerves, and 1 pair of coccygeal nerves. Each spinal nerve exits from the spinal cord through the intervertebral foramen between a pair of vertebrae or between the C1 vertebra and the occipital bone of the skull. The peripheral nervous system (PNS) includes all of the parts of the nervous system outside of the brain and spinal cord. These parts include all of the cranial and spinal nerves, ganglia, and sensory receptors. The somatic nervous system consists of peripheral nerve fibers that pick up sensory information or sensations from the peripheral or distant organs (those away from the brain like limbs) and carry them to the central nervous system. These also consist of motor nerve fibers that come out of the brain and take the messages for movement and necessary action to the skeletal muscles. For example, on touching a hot object the sensory nerves carry information about the heat to the brain, which in turn, via the motor nerves, tells the muscles of the hand to withdraw it immediately. The whole process takes less than a second to happen. The cell body of the neuron that carries the information often lies within the brain or spinal cord and projects directly to a skeletal muscle. The somatic nervous system (SNS) is a division of the PNS that includes all of the voluntary efferent neurons. The SNS is the only consciously controlled part of the PNS and is responsible for stimulating skeletal muscles in the body. These also consist of motor nerve fibers that come out of the brain and take the messages for movement and necessary action to the skeletal muscles. For example, on touching a hot object the sensory nerves carry information about the heat to the brain, which in turn, via the motor nerves, tells the muscles of the hand to withdraw it immediately. The autonomic nervous system (ANS) is a division of the PNS that includes all of the involuntary efferent neurons. The ANS controls subconscious effectors such as visceral muscle tissue, cardiac muscle tissue, and glandular tissue. There are 2 divisions of the autonomic nervous system in the body: the sympathetic and parasympathetic divisions. Sympathetic. The sympathetic division forms the body’s “fight or flight” response to stress, danger, excitement, exercise, emotions, and embarrassment. The sympathetic division increases respiration and heart rate, releases adrenaline and other stress hormones, and decreases digestion to cope with these situations. Parasympathetic. The parasympathetic division forms the body’s “rest and digest” response when the body is relaxed, resting, or feeding. The parasympathetic works to undo the work of the sympathetic division after a stressful situation. Among other functions, the parasympathetic division works to decrease respiration and heart rate, increase digestion, and permit the elimination of wastes. The enteric nervous system (ENS) is the division of the ANS that is responsible for regulating digestion and the function of the digestive organs. 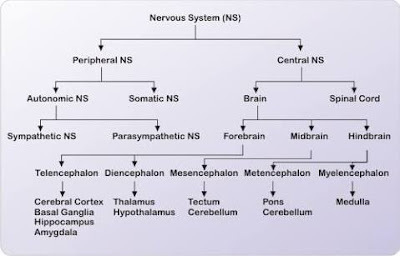 The ENS receives signals from the central nervous system through both the sympathetic and parasympathetic divisions of the autonomic nervous system to help regulate its functions. However, the ENS mostly works independently of the CNS and continues to function without any outside input. For this reason, the ENS is often called the “brain of the gut” or the body’s “second brain.” The ENS is an immense system—almost as many neurons exist in the ENS as in the spinal cord. Nerves are bundles of axons in the peripheral nervous system (PNS) that act as information highways to carry signals between the brain and spinal cord and the rest of the body. Each axon is wrapped in a connective tissue sheath called the endoneurium. Individual axons of the nerve are bundled into groups of axons called fascicles, wrapped in a sheath of connective tissue called the perineurium. Finally, many fascicles are wrapped together in another layer of connective tissue called the epineurium to form a whole nerve. The wrapping of nerves with connective tissue helps to protect the axons and to increase the speed of their communication within the body. Afferent, Efferent, and Mixed Nerves. Some of the nerves in the body are specialized for carrying information in only one direction, similar to a one-way street. Nerves that carry information from sensory receptors to the central nervous system only are called afferent nerves. Other neurons, known as efferent nerves, carry signals only from the central nervous system to effectors such as muscles and glands. Finally, some nerves are mixed nerves that contain both afferent and efferent axons. Mixed nerves function like 2-way streets where afferent axons act as lanes heading toward the central nervous system and efferent axons act as lanes heading away from the central nervous system. Extending from the inferior side of the brain are 12 pairs of cranial nerves. Each cranial nerve pair is identified by a Roman numeral 1 to 12 based upon its location along the anterior-posterior axis of the brain. Each nerve also has a descriptive name (e.g. olfactory, optic, etc.) that identifies its function or location. The cranial nerves provide a direct connection to the brain for the special sense organs, muscles of the head, neck, and shoulders, the heart, and the GI tract. Extending from the left and right sides of the spinal cord are 31 pairs of spinal nerves. The spinal nerves are mixed nerves that carry both sensory and motor signals between the spinal cord and specific regions of the body. The 31 spinal nerves are split into 5 groups named for the 5 regions of the vertebral column. Thus, there are 8 pairs of cervical nerves, 12 pairs of thoracic nerves, 5 pairs of lumbar nerves, 5 pairs of sacral nerves, and 1 pair of coccygeal nerves. Each spinal nerve exits from the spinal cord through the intervertebral foramen between a pair of vertebrae or between the C1 vertebra and the occipital bone of the skull. The neuron is the basic unit in the nervous system. It is a specialized conductor cell that receives and transmits electrochemical nerve impulses. 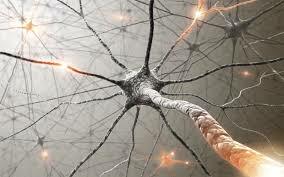 A typical neuron has a cell body and long arms that conduct impulses from one body part to another body part. The cell body is like any other cell with a nucleus or control center. The cell body has several highly branched, thick extensions that appear like cables and are called dendrites. The exception is a sensory neuron that has a single, long dendrite instead of many dendrites. Motor neurons have multiple thick dendrites. The dendrite's function is to carry a nerve impulse into the cell body. An axon is a long, thin process that carries impulses away from the cell body to another neuron or tissue. 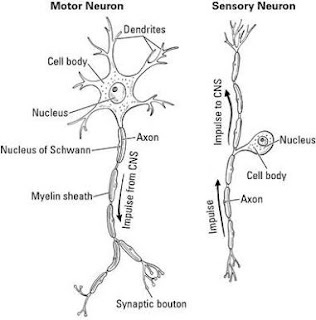 There is usually only one axon per neuron. The neuron is covered with the Myelin Sheath or Schwann Cells. These are white segmented covering around axons and dendrites of many peripheral neurons. The covering is continuous along the axons or dendrites except at the point of termination and at the nodes of Ranvier. The neurilemma is the layer of Schwann cells with a nucleus. Its function is to allow damaged nerves to regenerate. Nerves in the brain and spinal cord do not have a neurilemma and, therefore cannot recover when damaged. Bipolar neurons have one axon and one dendrite. These are seen in the retina of the eye, the inner ear, and the olfactory (smell) area. Unipolar neurons have one process extending from the cell body. 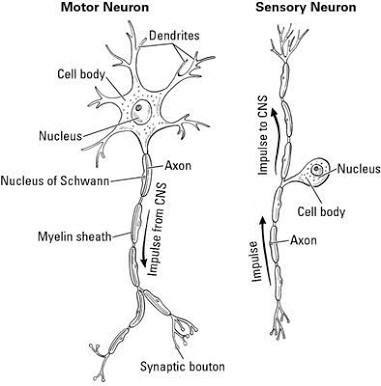 The one process divides with one part acting as an axon and the other part functioning as dendrite. These are seen in the spinal cord. Sensory. The sensory function of the nervous system involves collecting information from sensory receptors that monitor the body’s internal and external conditions. These signals are then passed on to the central nervous system (CNS) for further processing by afferent neurons (and nerves). Integration. The process of integration is the processing of the many sensory signals that are passed into the CNS at any given time. These signals are evaluated, compared, used for decision making, discarded or committed to memory as deemed appropriate. Integration takes place in the gray matter of the brain and spinal cord and is performed by interneurons. Many interneurons work together to form complex networks that provide this processing power. Motor. Once the networks of interneurons in the CNS evaluate sensory information and decide on an action, they stimulate efferent neurons. Efferent neurons (also called motor neurons) carry signals from the gray matter of the CNS through the nerves of the peripheral nervous system to effector cells. The effector may be smooth, cardiac, or skeletal muscle tissue or glandular tissue. The effector then releases a hormone or moves a part of the body to respond to the stimulus. 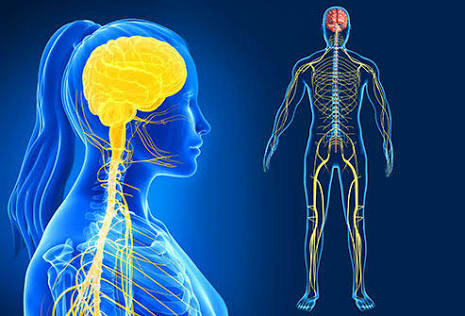 At the most basic level, the function of the nervous system is to send signals from one cell to others, or from one part of the body to others. There are multiple ways that a cell can send signals to other cells. One is by releasing chemicals called hormones into the internal circulation, so that they can diffuse to distant sites. In contrast to this "broadcast" mode of signaling, the nervous system provides "point-to-point" signals—neurons project their axons to specific target areas and make synaptic connections with specific target cells. Thus, neural signaling is capable of a much higher level of specificity than hormonal signaling. It is also much faster: the fastest nerve signals travel at speeds that exceed 100 meters per second. At a more integrative level, the primary function of the nervous system is to control the body. The evolution of a complex nervous system has made it possible for various animal species to have advanced perception abilities such as vision, complex social interactions, rapid coordination of organ systems, and integrated processing of concurrent signals. In humans, the sophistication of the nervous system makes it possible to have language, abstract representation of concepts, transmission of culture, and many other features of human society that would not exist without the human brain. The central nervous system is protected by major physical and chemical barriers. Physically, the brain and spinal cord are surrounded by tough meningeal membranes, and enclosed in the bones of the skull and spinal vertebrae, which combine to form a strong physical shield. Chemically, the brain and spinal cord are isolated by the so-called blood–brain barrier, which prevents most types of chemicals from moving from the bloodstream into the interior of the CNS. These protections make the CNS less susceptible in many ways than the PNS; the flip side, however, is that damage to the CNS tends to have more serious consequences. Although nerves tend to lie deep under the skin except in a few places such as the ulnar nerve near the elbow joint, they are still relatively exposed to physical damage, which can cause pain, loss of sensation, or loss of muscle control. Damage to nerves can also be caused by swelling or bruises at places where a nerve passes through a tight bony channel, as happens in carpal tunnel syndrome. If a nerve is completely transected, it will often regenerate, but for long nerves this process may take months to complete. In addition to physical damage, peripheral neuropathy may be caused by many other medical problems, including genetic conditions, metabolic conditions such as diabetes, inflammatory conditions such as Guillain–Barré syndrome, vitamin deficiency, infectious diseases such as leprosy or shingles, or poisoning by toxins such as heavy metals. Many cases have no cause that can be identified, and are referred to as idiopathic. It is also possible for nerves to lose function temporarily, resulting in numbness as stiffness common causes include mechanical pressure, a drop in temperature, or chemical interactions with local anesthetic drugs such as lidocaine. Intelligence, learning, and memory. At birth, the nervous system contains all the neurons you will ever have, but many of them are not connected to each other. As you grow and learn, messages travel from one neuron to another over and over, creating connections, or pathways, in the brain. It's why driving seemed to take so much concentration when you first learned but now is second nature: The pathway became established. In young children, the brain is highly adaptable; in fact, when one part of a young child's brain is injured, another part can often learn to take over some of the lost function. But as we age, the brain has to work harder to make new neural pathways, making it more difficult to master new tasks or change established behavior patterns. 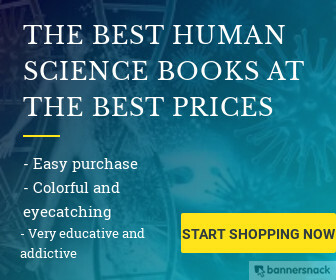 That's why many scientists believe it's important to keep challenging your brain to learn new things and make new connections it helps keeps the brain active over the course of a lifetime. Memory is another complex function of the brain. The things we've done, learned, and seen are first processed in the cortex. Then, if we sense that this information is important enough to remember permanently, it's passed inward to other regions of the brain (such as the hippocampus and amygdala) for long-term storage and retrieval. As these messages travel through the brain, they too create pathways that serve as the basis of our memory. Different parts of the cerebrum are responsible for moving different body parts. The left side of the brain controls the movements of the right side of the body, and the right side of the brain controls the movements of the left side of the body. When you press the accelerator with your right foot, for example, it's the left side of your brain that sends the message allowing you to do it. The sympathetic nervous system prepares the body for sudden stress, like if you see a robbery taking place. When something frightening happens, the sympathetic nervous system makes the heart beat faster so that it sends blood more quickly to the different body parts that might need it. It also causes the adrenal glands at the top of the kidneys to release adrenaline, a hormone that helps give extra power to the muscles for a quick getaway. This process is known as the body's "fight or flight" response. The senses. Your spouse may be a sight for sore eyes at the end of a long day — but without the brain, you wouldn't even recognize him or her. Pepperoni pizza sure is delicious — but without the brain, your taste buds wouldn't be able to tell if you were eating pizza or the box it came in. None of your senses would be useful without the processing that happens in the brain. Sight probably tells us more about the world than any other sense. Light entering the eye forms an upside-down image on the retina. The retina transforms the light into nerve signals for the brain. The brain then turns the image right-side up and tells us what we are seeing. Every sound we hear is the result of sound waves entering our ears and causing our eardrums to vibrate. These vibrations are then transferred along the tiny bones of the middle ear and converted into nerve signals. The cortex then processes these signals, telling us what we are hearing. The tongue contains small groups of sensory cells called taste buds that react to chemicals in foods. Taste buds react to sweet, sour, salty, and bitter. Messages are sent from the taste buds to the areas in the cortex responsible for processing taste. Olfactory cells in the mucous membranes lining each nostril react to chemicals we breathe in and send messages along specific nerves to the brain — which, according to experts, can distinguish between more than 10,000 different smells. With that kind of sensitivity, it's no wonder research suggests that smells are very closely linked to our memories. The skin contains more than 4 million sensory receptors — mostly concentrated in the fingers, tongue, and lips — that gather information related to touch, pressure, temperature, and pain and send it to the brain for processing and reaction.